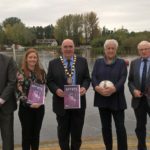 Fermanagh & Omagh Sports Forum have launched its annual Sports Awards for 2018. The awards, which are organised by the Sports Forum on behalf of Fermanagh and Omagh District Council, recognise and celebrate the achievements of athletes and teams from the Council district during 2018. It is not necessary to submit a number of nominations for one candidate as the final shortlist of nominees will be compiled by Fermanagh and Omagh Sports Forum and will not be based on the number of nominations received. Award winners will be announced at the Fermanagh and Omagh Sports Forum Awards evening at the Killyhevlin Hotel, Enniskillen, on Friday 1 March 2019. For further information and nomination forms visit the Sports Awards section of the Council website, www.fermanaghomagh.com. Nominations for the Sports Awards close at 5 pm on Friday 4 January 2019. For further enquiries please contact Keith Collen, Fermanagh and Omagh District Council, on 0300 303 1777.